Ever Visit a famous sights such as the Big Ben, Sydney Opera House, Times Square, Eiffel Tower, Colosseum? Explore parts of the world you’ve always wanted to visit with Google Maps Street View. Launch On May 25, 2007 by Google under Google Maps. By using this Google street view feature you can travel virtually through panoramic detail of place you always wanted to visit. Even if you are planning to go, it’s good for you to take a look of the place first. So you might know what to prepare before reach that destination. 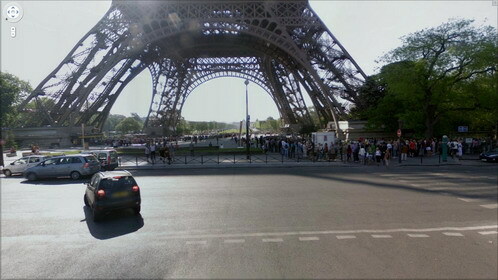 Google Maps Street View photo preview. Location: Eiffel Tower, Paris. Such technology also invoke a significant amount of controversy in the days following its release. Initially privacy concerns erupted due to the uncensored nature of its panoramic detail photographs around the world. Since then, Google has begun blurring faces using an automated face detection technology. While angering many privacy advocates, Google Maps Street View has been known in one instance to help a victim of crime. A Dutch boy happened to find a photo on Street View showing him with two men right before they allegedly mugged him. Authorities were able to use these photos and arrest the assailants. Google Street View has exposed crimes such as prostitution, vandalism, and assault but the most famous photos that distributed around internet is prostitutes photo around the world. Refer picture at the end of the article. There are a lother feature in Google Maps along with Google Maps Street View and Google Ditu, Google Moon,Google Mars, Google Sky, Google Ride Finder, Google Transit, Google My Maps, Google Latitude, Google Flu Shot Finder, Monopoly City Streets. This entry was posted on Friday, November 27th, 2009 at 3:10 pm	and is filed under Advice and Guide, Interesting Stuff. You can leave a response, or trackback from your own site. One Response to "Free Tour Around The World With Google Maps Street View"